I spent this weekend in a technicolour dream. Baking, writing, creating. And then I received two amounts of crazy good news, that I cannot wait to share soon. It’s still all such a fantasy. And I made these Dark Chocolate Chunk, Rye and Sour Cherry Cookie Ice Cream Sandwiches too. They were so good and went just as quickly as they arrived. 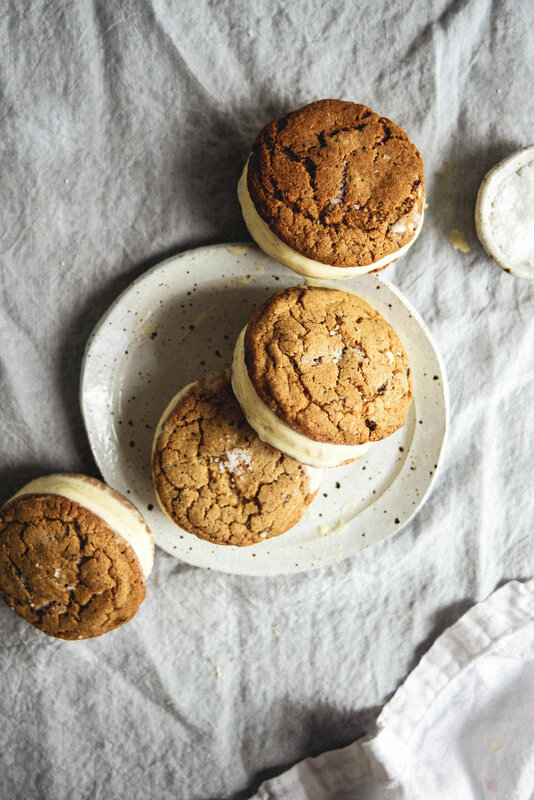 And even though it’s the (not so)cool winter here at the moment, these ice cream sandwiches are something I can see myself eating, in any season. The truth. Prior to this, I’ve never made ice cream sandwiches before. Eaten them sure. 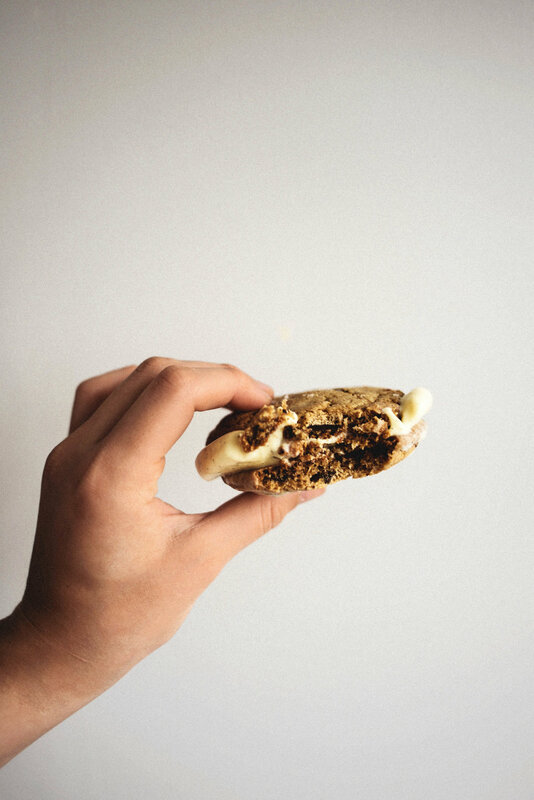 I liked the double chocolate cookie dough ice cream sandwiches that adorned childhood summers and the ambivalent memories of sandwiching a banana, brown sugar & candied bacon ice cream between two thick white chocolate chunk and pecan cookies. It’s dessert debauchery. For sure, extravagant. I find that the combination of both the alternate flours gives a more nutty and toasted taste. More textured, and substantial, if thats even possible. The additions of dark chocolate chunks and bursts of sourness from the cherries, has to be one of my favourite things about the cookies too. So sweet, but tangy. And just layered with complex texture and flavour. And with a sprinkle of flaked salt on top too? Incredibly addictive. A very vanilla Vanilla Ice Cream then gets sandwiched between the cookies. It’s the best Vanilla Ice Cream I’ve had the pleasure of making. It actually tastes like real vanilla ice cream. It’s sweetly smooth, creamy, luxurious. And studded with a plethora of those infamous black hued seeds. Sure, you could do without making it from scratch…just use a tub of your favourite store bought ice cream instead (hello, double chocolate! a mocha or coffee base would be amazing too.) But, I think that making your own ice cream from scratch, provides a whole lot of extra satisfactory feelings. Not to mention, an extra pow of flavour. Place the milk, cream and vanilla bean seeds in a medium sized saucepan set over medium-low heat. Heat the mixture, whisking occasionally, until it reaches a light rolling boil. Meanwhile, use an electric or hand whisk, to whisk the egg yolks and sugar together until thick and pale in colour. Once the milk mixture is at temperature, slowly ladle a little bit of it into the bowl with the yolks. Whisk vigorously to combine so that the yolks become acclimatised to the heat. Ladle in a bit more of the mixture and again, whisk to combine. Pour it back into the saucepan with the remainder of the liquid on the stove. Continue to heat, stirring constantly with a rubber spatula, until the mixture is thick enough to coat the back of a spoon. Do not allow it to come to a rolling boil. It is ready when a few sparse bubbles form in the middle of the mixture. Remove the saucepan from the heat and stir in the vanilla bean extract and salt. When you are ready to churn the ice cream, pour it into the bowl of an ice cream machine and churn according to the manufactures instructions. The ice cream is ready when it is thick, creamy and increased in volume. Transfer the ice cream into a container or metal loaf tin, cover it with a layer of aluminium foil and chill it in the freezer until firm before using it to assemble the ice cream cookie sandwiches. Pre-heat the oven to 180 C (350 F). Line three baking trays with parchment paper. Set aside. Place the butter and sugars in the bowl of a stand mixer fitted with the beater attachment. Cream the mixture on medium speed until it is light and fluffy, 4 to 5 minutes. Scrape down the bottom and sides of the bowl as needed. Meanwhile, whisk together the flours, baking powder, soda, cinnamon and salt in a medium sized mixing bowl. Set aside. Add the egg and vanilla into the beating butter mixture, beat until well combined. Pause mixing to scrape down the bottom and sides of the bowl. Add the dry flour ingredients into the mixture, and beat until just combined. Add in the roughly chopped dark chocolate and sour cherries, and beat until they are evenly dispersed throughout the dough. Remove the bowl from the stand mixer. Using a cookie scoop or a tablespoon, form small golf ball sized balls about 40 grams in weight. You should have about 16 in total. Set the balls on the prepared baking trays, making sure to leave enough room for spreading. Sprinkle the tops of the cookie balls with a pinch of flaked sea salt. Bake the cookies for 15 to 19 minutes, or until golden brown and firm around the edges and slightly soft in the center. Remove the cookies from the oven and let them cool on their trays for 10 minutes before inverting out and onto a wire rack to let cool completely before assembling. To assemble the cookies, arrange 8 of the cookies flat side up on a lined baking tray. Top each cookie with a generous scoop of the vanilla bean ice cream and top with another cookie, flat side facing down. Apply a small amount of pressure to sandwich the cookies together, making sure to spread the ice-cream to the edges. Cover the baking tray with a layer of aluminium foil and freeze until firm, 1 hour.